What's in a lesson, and how do I complete it? Read lesson content, participate in discussions, and submit writing assignments. Many classes on Wet Ink have multimedia lesson provided by your instructor, although Wet Ink is also used to for classes which may or may not include weekly lessons. If you have lessons to complete, you’ll be able to view them by clicking on 'Lessons' from class navigation. 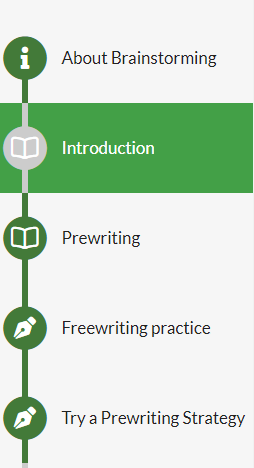 Click the lesson title (in green) to view the lesson content. All the lessons may not be available and open immediately. If a lesson isn’t open yet, it will be in gray and, if clicked, you will see a message letting you know when it will open. An "i" icon means that this section is the introductory, "about" section of your class. A "book" icon means that this section has reading content but also likely has videos, audio, and embedded discussion questions to complete. A "pen" icon means that this section includes an assignment.